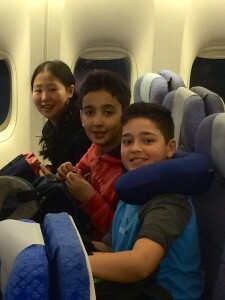 Three Year Six students from North Star Montessori recently traveled to New York City to represent their school as delegates of Guatemala in the Montessori Model United Nations program. They spent seven months learning about the country they were to represent, preparing position papers and speeches on their assigned topics, and fundraising for their trip through a variety of student led fundraising initiatives. With great support from the school-wide community, the students were able to raise a substantial portion of the funds required and headed off to New York City for a week of adventure, collaboration, learning, personal growth and fun! Over the next few days, you will find blog posts highlighting our successful trip. 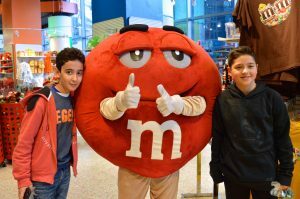 Students, parents and teachers met at the Vancouver Airport on Sunday evening and after checking in and saying our goodbyes, the students and teachers proceeded through airport security to the gate to await the overnight flight to New York. The flight was uneventful (thankfully) and we got some sleep, though not much. By the time we got to our hotel in Mid-Town Manhattan around 9am, we were hungry and tired, and felt VERY grateful that we were able to check in early to catch a few winks before heading out into the city. After a few hours of sleep and organizing ourselves, we walked over to Time Square to find a place for dinner. 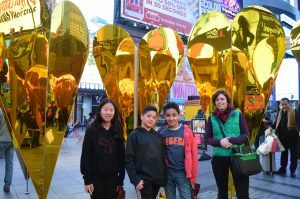 We strolled along visiting some souvenir shops, the popular M & M and Hershey Chocolate stores, and took in a public art display before agreeing on a place to have dinner. 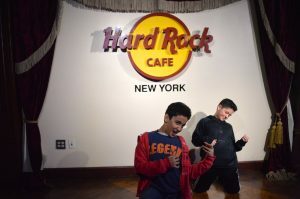 Eventually we settled on Hard Rock Cafe where we enjoyed the historical and more recent display of musical memorabilia. Still adjusting to the time change and recovering from such little sleep, we decided to head back to the hotel to get a good night’s sleep in preparation for our visit to the Museum of Natural History the following day.